As one of the leading cultural venues in Los Angeles and one of the country’s most prestigious Jewish cultural institutions, the Skirball Cultural Center needs no introduction. Despite being located off Sepulveda Boulevard in one of the busiest areas of LA, the wooded paradise, tucked into the Santa Monica Mountains, immediately diffuses the stress of city life. Originally designed by esteemed architect Moshe Safdie, the Skirball has expanded; among its newest additions are the 9,000-squarefoot Guerin Pavilion and the adjoining 6,700-square-foot Herscher Hall, both of which enhance the center’s inviting aura as a wedding site for couples of any faith. 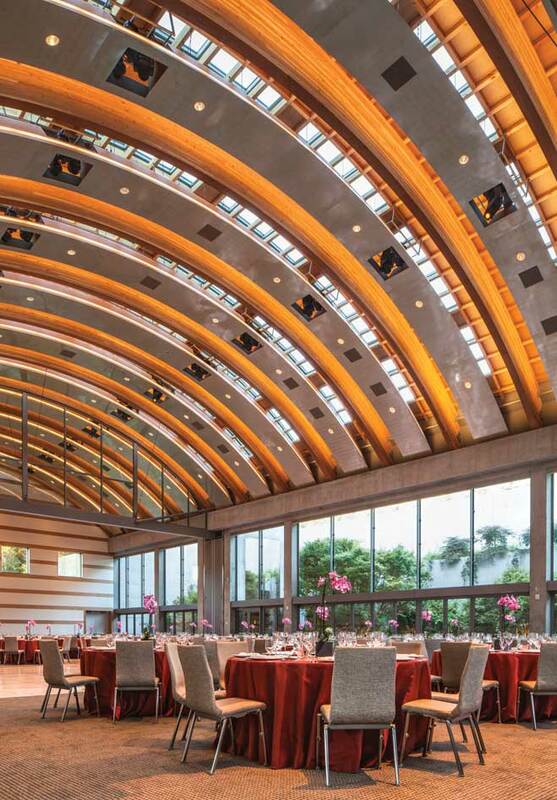 A seamless extension of the Skirball, the Guerin Pavilion features a ballroom with a majestically arched ceiling. Glass walls and windows fill the space with angelic lighting and provide views of the Skirball’s cascading, tiered gardens. Dedicated to providing the utmost comfort and luxury for guests, the pavilion features a breathtaking bridal suite furnished with a leather tufted sofa, barrel chairs upholstered in Alexander Girard fabric, lighted makeup mirrors, black cherrywood floors and spacious marble bathrooms. Attached to the ballroom is Herscher Hall, which gives couples access to a reception area as well as additional rooms and pre-ceremony suites. Embellished with multiple fountains, sitting areas and lush greenery, the welcoming outdoor space is the perfect area for as many as 650 wedding guests to mingle. The Skirball also offers endless wedding amenities, ranging from event planning services to customized catering. One of the venue’s most appealing features, however, is the space’s ability to provide a blank yet spectacular canvas for every bride. First class amenities, urban details and sophisticated settings provide a one-of-a-kind experience, and its proximity to the business district, John Wayne Airport, shopping sites and coastline make for a luxurious stay unlike any other. Ojai Valley Inn has debuted a brand new $20 million event center, The Farmhouse at Ojai Valley Inn. There is nothing quite like dining at the world’s premier culinary college in the stunning Napa Valley. The CIA’s two Napa venues, Greystone and Copia, offer versatile facilities and assitance from event professionals to make planning your wedding a breeze.